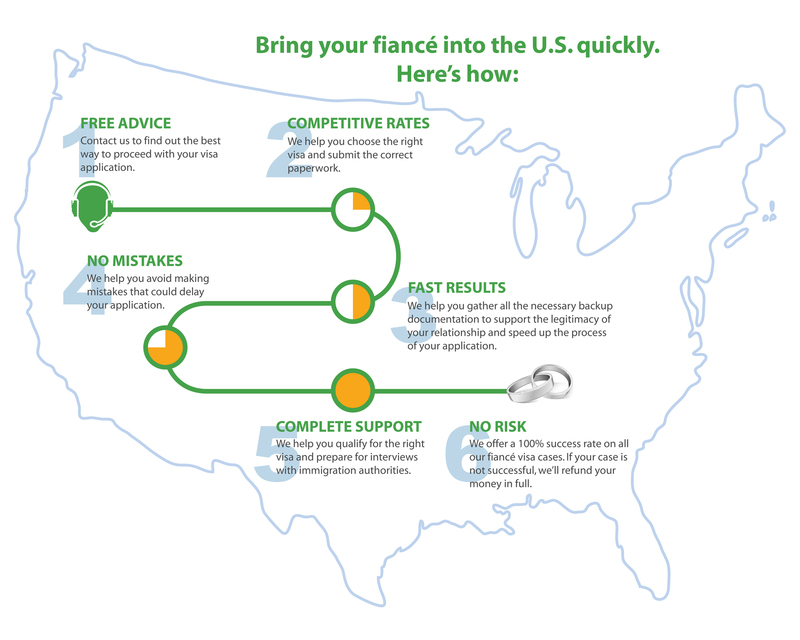 How much does a K-1 visa cost? There may be other minor charges based on the country where the case is being processed. These are current fees and subject to change. These fees will be the same whether you file the case yourself or you hire a lawyer or other service to help you. option has a different cost. Option #1: You can always try to save a bit of money and file the fiancé visa yourself. The Cost to represent yourself in a K-1 case is nothing. You can pick up the forms from U.S. Citizenship and Immigration Services (uscis.gov) and try to tackle the mountain of confusing paperwork yourself. However, it is likely that you will spend many hours trying to figure out how to proceed. You will need to learn new terminology, follow all of the procedures exactly and make sure to follow government instructions. If any problems arise you will likely receive a Request for Evidence from USCIS. In that case you will need to either figure out how to solve the problems or hire an attorney to resolve the problems for you. All the while your case is being delayed by weeks or months or it will possibly be denied. Option #2: Hire a Paralegal or Notario Service. Cost is likely to be between $300 to $600. These companies may not be required to be licensed, regulated or insured and you may be seriously jeopardizing your future by trying to save a few hundred dollars. Some of these companies are offshore with absolutely no oversight. Even if these companies are in the United States you may not have any legal recourse against them should your case be handled incorrectly. My office has been contacted several times over the years by clients asking us to take over cases that were incorrectly handled by non-attorneys. These cases were needlessly delayed because they were not handled correctly. Option #3: Hire a Law Firm to Handle the Case. Cost is likely to be between $800 and $2000 Generally the cost to work with a law firm on your fiance visa case will be between $800 and $2000 for legal fees. Some law firms charge by the hour (generally $250-$400 per hour worked on the case). Law Firms are regulated by their State Bars and working with attorneys is always the preferred way handle any type of immigration case. Immigration Attorneys will review your situation from all angles and help you make the correct decision in your case. Option #4 Hire our Law Firm. Cost is $995. This is the flat legal fee for most cases. Let our experienced Immigration law firm walk you through the maze of U.S. immigration law and tell you, in plain English, what’s relevant and important in your case. Most importantly, we’ll help you identify any potential issues and weaknesses in your case and figure out how together we can overcome them. If you work with our office only licensed and insured attorneys will have access to your information and will be working on your case. We will explain all of your options to you and help you choose the best option. We will then handle your case from the initial paperwork until your fiancé arrives in the United States. Everything is done for a flat fee. In the unlikely event a problem arises in your case we will handle it for you. Now that is peace of mind. The choice is yours. 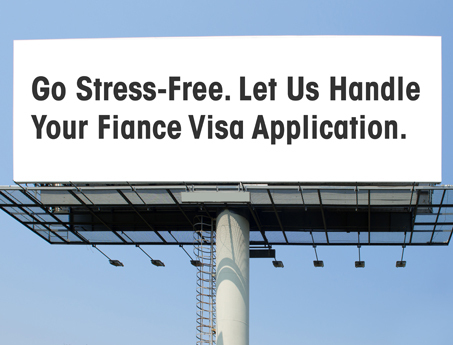 You can do it yourself, work with a non-attorney who may not be licensed, or deal with a quality law firm with over 20 years of experience handling fiancé visa cases. We would be happy to talk to you, Free of charge, about your case.